New Mexico can be a place where communities thrive and there is opportunity for everyone to realize their potential. We know what it takes to create strong communities—good schools, roads, libraries, and so forth. Unfortunately, the mechanism for realizing this future—the state budget—prioritizes tax breaks that starve our state of the revenue it needs to fund critical programs and services. This is the wrong choice for New Mexico’s future. To afford the things we need, it will take a more sensible approach. 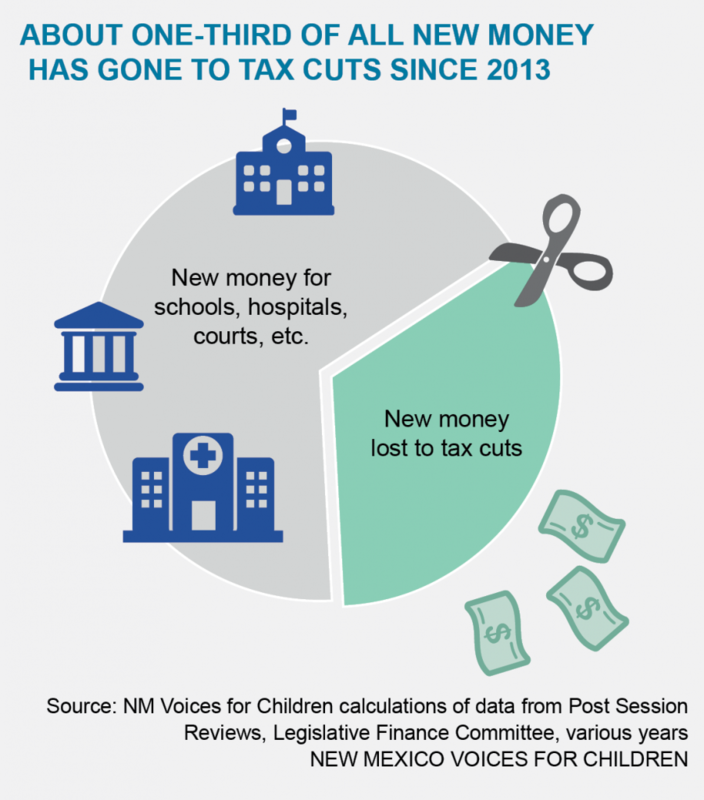 If we could recoup the millions of dollars in tax breaks we’re losing to powerful special interests, we’d have more for the public investments New Mexico’s businesses and economy need. Investments like a well-educated and skilled workforce, state-of-the-art health care, up-to-date communications infrastructure, and affordable child care, to name just a few. 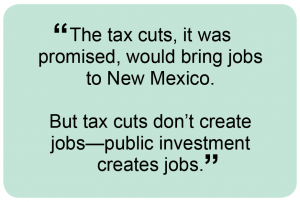 After years of enacting tax cuts that didn’t create jobs, New Mexico is now too dependent on revenue from gas and oil extraction. These tax cuts have done so much damage that we ended up with a hole in our budget. That hole was only partly filled during the special session in October. We will still be short hundreds of millions of dollars for the current and next fiscal years when legislators meet in 2017. We have a choice: stick with ineffective tax cuts or raise enough money to make the investments we need to promote economic growth. 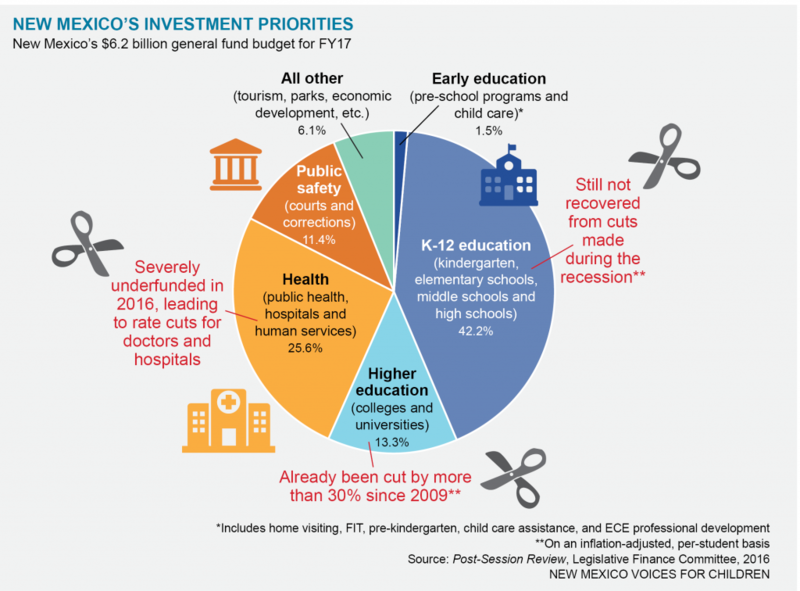 If we increased public investment in health care and education—two areas where New Mexico needs to grow—we’d be able to have smaller class sizes in our schools, more working families could be helped with child care, we could reopen the school-based health centers that had to close, and we could lower college tuition to what it was before we made all the deep cuts to higher education funding. The big corporate tax cut of 2013 phases in over 5 years and will cost the state $70 million a year when fully phased-in. We could freeze the corporate tax rates where they are now and save millions for public investment. Could raise $70 million if repealed or $20 million if frozen through FY20. At the same time the corporate income tax rate was cut, the formula for how manufacturers were taxed was made less fair. The phase-in could also be frozen so we don’t continue to lose revenue. Could raise at least $45 million if repealed or $10-$15 million if frozen. A full repeal of the 2003 cuts would raise up to $500 million. 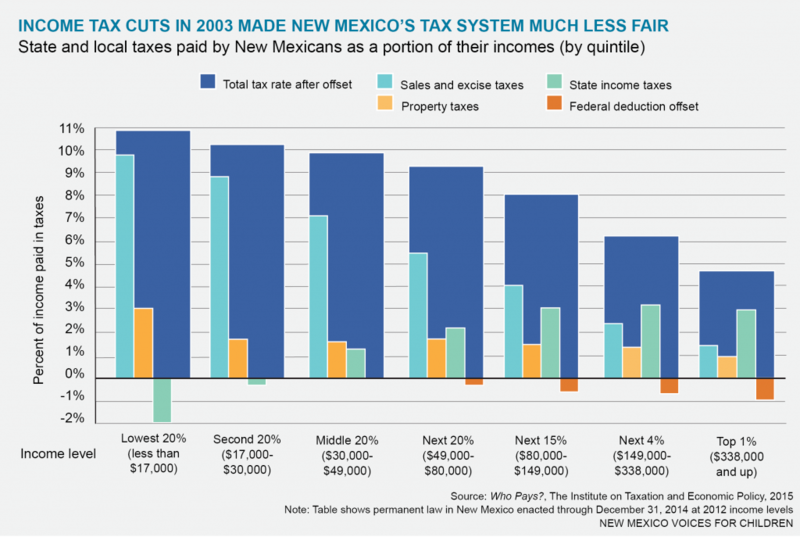 New Mexico taxes income from capital gains (the profits from sales of assets such as stocks or real estate) at a lower rate than it taxes the wages of working people. This break mainly helps the wealthiest—those making over $200,000—while taking revenue away from much-needed public investment. It also helped make our tax system less fair. Could raise $34-$36 million in FY18; $44-$48 million in FY19. There are hundreds of tax breaks that have been carved out of the GRT base over the years, many of which simply qualify as a handout to special interests. What’s more, few of them have ever been evaluated for effectiveness. Repealing wasteful and ineffective tax breaks will allow lawmakers to put that money to work in our schools and communities where it will benefit everyone. Could raise hundreds of millions. New Mexico is one of the few states that still allows out-of-state corporations to shift their New Mexico profits on paper to another state to avoid paying taxes here. We lose millions in revenue, and local businesses lose out. A partial fix (called Mandatory Combined Reporting) to this was enacted in 2013, but it exempted many profitable corporations such as banks. 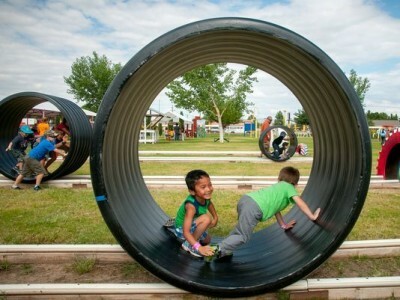 New Mexico has the nation’s second largest Land Grant Permanent School Fund. Legislators and voters could choose to increase the distribution of that fund, which would help us better fund K-12 schools and our higher education system, as well as invest a tiny portion in the early childhood education programs that will help our kids do better in school so more of them can attend college. Increasing the distribution by 2% could provide $300 million. Instead of facing cuts in Medicaid reimbursement rates, many health care providers would prefer to be assessed a provider fee. The money collected could then be added to the state’s Medicaid budget, allowing the state to draw down the federal matching money. Amount raised would vary depending on rates. These taxes could both increase revenue and promote greater wellness, particularly when it acts as a disincentive for young people to take up smoking. A 20% increase in both taxes could raise $26 million; an increase in the alcohol tax of 25-cents a drink could raise $154 million. New Mexico’s excise tax on motor vehicles is lower than the general sales tax on most other goods purchased in the state. It’s also lower than in surrounding states, and could stay lower even if this proposal is put into effect. Could raise about $100 million. When the federal government makes changes to the income tax code, those changes often affect state tax codes unless states take action. New Mexico could decouple from two current federal rules: bonus appreciation and the cancellation of indebtedness provision of the American Reinvestment and Recovery Act; as well as one potential rule: a deduction for domestic production activities. Could raise between $10-$14 million. While gas prices are low, New Mexico could enact a temporary hike in the taxes we pay at the pump. The tax could be set to automatically expire if fuel prices rise to a certain level. Could raise $60 million for every 5 cents per gallon.